One of the biggest expenses for many business owners is the cost associated with hiring, training, and maintaining employees—and in terminating their employment. When companies downsize, one of the first places they look to trim costs is by reducing the number of employees and/or employee-related expenses such as benefits packages. Downsizing is sometimes necessary, but never to be taken lightly. It sends a message to stockholders and investors as well as to customers that a business is struggling. 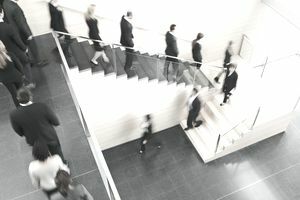 Layoffs also contribute to lower employee morale and may even lead to other employees being concerned about their jobs and leaving on their own. Consider All Your Options: Before laying off employees, be sure that you have looked at all the options, including asking your employees what they would be willing to sacrifice for the good of the company. Employees can show surprising loyalty and flexibility for the good of the company, and to save their jobs when being faced with downsizing or layoffs. Because employee morale will always be affected when a company downsizes, it makes good business sense to allow employees to chime in with their opinions and feelings. Few things make employees feel less valued than to surprise them in a meeting or memo that people will be let go. Your employees are in the day-to-day trenches, and some may even have ideas on how to save the business money or be willing to give up benefits, change their hours, or make other accommodations to keep their jobs. Solicit Your Employees for Their Ideas: Never underestimate the value of simply asking your employees for their suggestions and ideas. Even if their ideas do not make good business sense and cannot be put into action, you, as the employer, will have demonstrated to your workers that they matter. This morale booster may prove beneficial to employees who remain in your employment, especially if their job duties increase as a result of laying off other workers. Offer Job Sharing: If you can combine the skills of two employees into one position, job sharing can help both employees keep their jobs but will cut your hourly wage costs. This may not work for all employees, but for some, reduced hours may be a preferable alternative to losing their job. Cut Back on Employee Benefits: Most workers need their health insurance benefits, but other benefits like vacation pay or sick leave may be able to be trimmed down, or your policies can be revised to make them more cost-effective. For example, requiring employees to work a certain number of hours to accrue paid sick leave, rather than offering it all up front, can spread the costs out over time. Change Your Work Week: Many local governments throughout the country save money by staying open for business four days a week instead of five. This saves on salaries as well as operating costs. If layoffs are coming, you either need to make the details as public as possible to avoid panic or keep things completely under wraps. When information is "leaked," it is often misinformation that ends up as gossip and can cause employee relations problems. Have a plan in place in advance for those you are terminating. Offer severance pay if you can and consider handing them an "exit" package with tips on job hunting, job leads, reference letters, and special resource and hotlines for the unemployed. Try not to feel too bad; as hard as it is to lay off anyone during a downsize, if it is necessary in order to preserve the longevity of your business, you can rehire when you are in a better position to do so. Every day, businesses all over the world reorganize and downsize. It is nothing to be ashamed of, it is just an unfortunate reality for many businesses. Remember, though, before laying off employees, be sure that you have looked at all the other options.